Meteora ("suspended in the air") is the most important complex of Orthodox monasteries after this of Mount Athos. The monasteries are on the top of natural sandstone rock pillars (300m high). More than 20 monasteries were built in 14th century A.D. under very hard conditions. Initially the access to the monasteries was very difficult & it was achieved by long ladders or large nets. Until 17th century the main means of conveying goods & people were baskets & ropes. Later, steps were cut into the rocks making the complex accessible via bridge. Today only six monasteries remain operational. 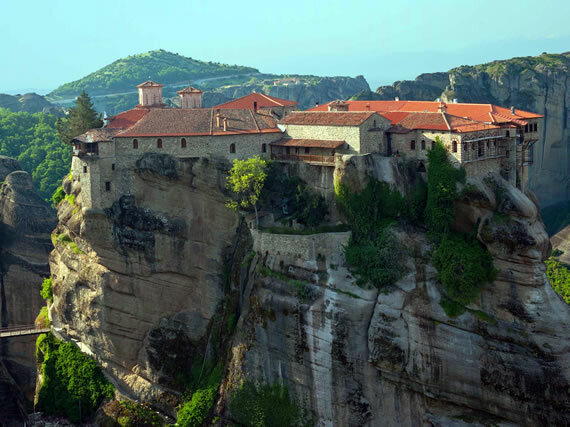 Great Meteoron is the greatest of all the monasteries & it was founded in the mid of 14th century by the Saint Athanasios the Meteorite. The monastery was expanded by its second founding father Ioassaf. The Catholicon is built in accordance to athonite architecture. This catholicon was incorporated as "Vema" in the new impressive church built in 16th century. It was founded in 1518 by the two brothers Theofanis & Nektarios. 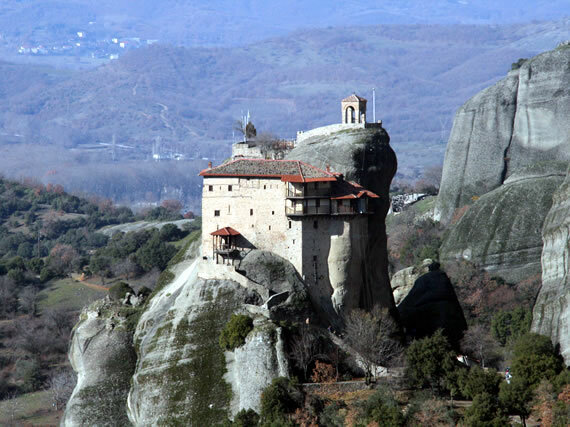 It took its name from the ascetic Varlaam who first lived in the rock where the monastery is built. The Catholicon, dedicated to all Saints, was built in 1541. It was decorated with frescoes in 1548 by the famous artist Katelanos. The monastery houses reliquaries, icons, gold-embroidered epitaphs & a rich collection of manuscripts. The parchment Gospel regarded as the personal holly book of the Emperor Konstantinos the Porfyrogenitos. 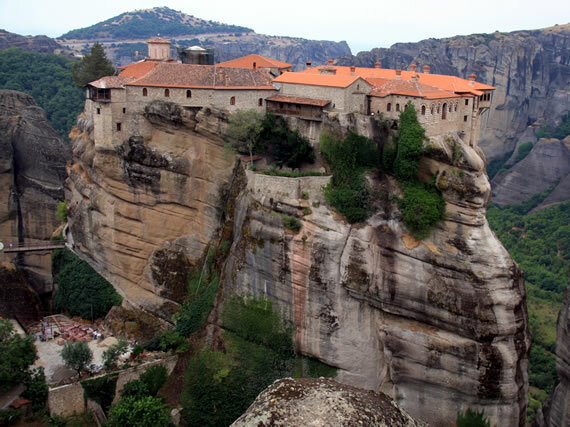 The rock of the Saint Stephanos monastery was first inhabited by monks in 12th century. In accordance to unconfirmed information the founder of the first monastery in 1191 was a holy hermit named Jeremiah. The present church of Saint Stephanos was probably built in the mid 16th century. It is a one clete basilica with wooden roof. The magnificent Catholicon, dedicated to Saint Charalampos, was built in 1798. The holy skull of the saint is kept there, a present to the monastery from the prince Vladislav of Vlachia. The monastery houses valuable ecclesiastical relics. 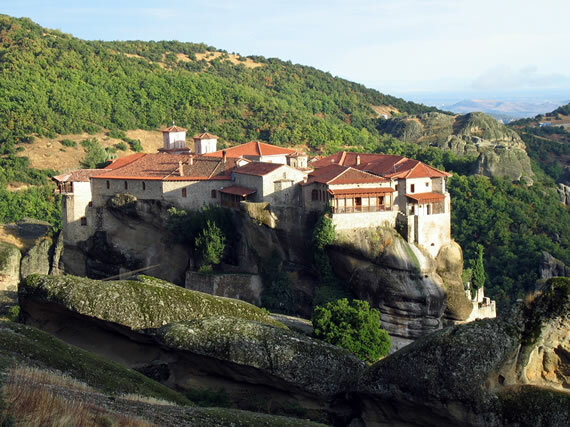 The monastery is built in a slim rock which offers a panoramic view of Meteora landscape. Its name probably was taken by an earlier hermit who lived in the rock. The Catholicon was built in 1545 by the two brothers Ioassaf & Maximos. It is dedicated to the Metamorphosis of Sotiros (Transfiguration of the Saviour), but it celebrates the memory of Saint Barbara. 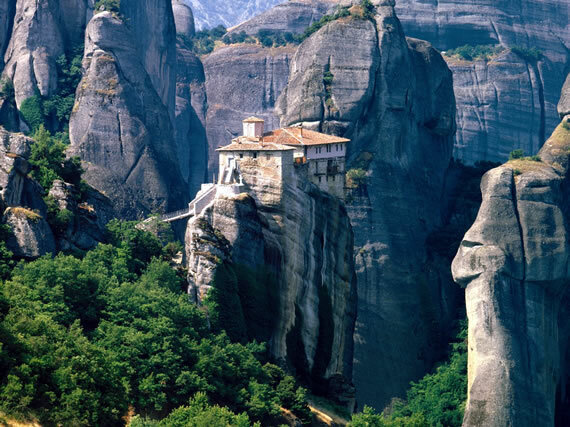 The monastery was founded around 1500 by Dionysios the Metropolitan of Larissa. The Catholicon, a church with inner narthex dedicated to Saint Nicolas, was decorated with wall paintings in 1527 by the famous Cretan painter Theophanis Bathas-Strelitzas. One of the most impressive depictions is Adam In Paradise naming the animals & birds. 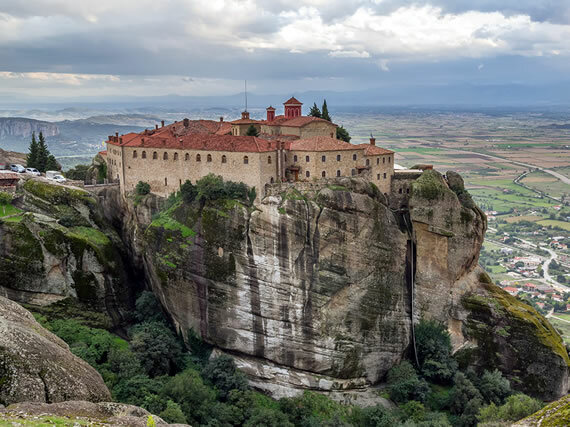 In accordance to tradition the monastery was built in 14th century by a monk named Dometios. The cross-shaped two pillar church was built in 1475 while the frescoes were made in 1741. The visitor, on the way up the 140 steps to the monastery, passes the chapel of Saint John the Baptist with remarkable wall paintings dated in 1682.